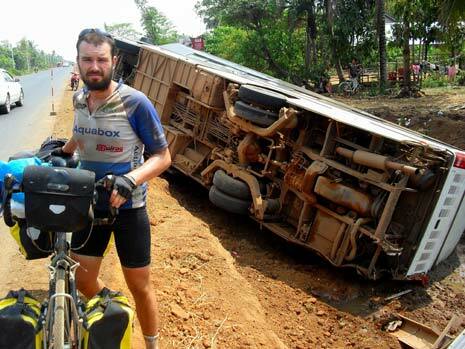 Long distance cyclists Dave Cook and Paul Cave of Baslow, Derbyshire, have vowed to carry on with their 9,000-mile charity ride through South East Asia, despite a nightmare coach crash in Cambodia which left one of their team and a friend in hospital and saw some of their most valuable equipment looted from the wreckage of the overturned bus. 'Action4Asia' expedition's communications officer, Norwegian schoolteacher Arja Soermoand her friend, Catherine Henson, both received head injuries when the coach travelling towards Phnom-Penh crashed at speed at 5am, ran into a deep roadside ditch and overturned. The indications are that the driver fell asleep at the wheel. Arja's injuries needed stitches. Catherine, who was on a short visit to the team from Norway, was given an MRI scan and found to have internal bleeding at the back of her head. She may now be flown to Bangkok for more specialist treatment. In the confusion following the crash, thieves targeted the expedition's luggage and stole their laptop, action camera and hard drive containing valuable video footage, as well as Catherine’s purse with her bank cards and Ipod. "We are finding it hard to communicate with the doctors because of language problems. Both girls have been traumatised by the accident but we think Arja will carry on with us", said former Lady Manners Shool student Dave in a message back to Derbyshire this week. Arja and Catherine were travelling on the bus from Siem-Reap to Phnom-Penh because Cambodian Customs officials would not allow the expedition's support vehicle to travel through the country. The Rotary Club of Phnom-Penh helped the team with various problems after the crash. Rotarians also came to the rescue after Paul was involved in a low-speed, minor collision with a scooter in Thailand, which buckled the front wheel of his bike. Primary objective of the 'Action4Asia' expedition is to document - on film and in the social media - life in the nine countries through which they travel and the work being undertaken by international aid agencies to improve the lot of local people, many of whom eke out a miserable living in the most basic of conditions. A secondary aim is to raise funds for UNICEF and the Derbyshire-based Rotary Club of Wirksworth's internationally-acclaimed aquabox project. which provides clean water for communities affected by man-made or natural disasters. The expedition still has to travel through Vietnam, Laos, Thailand, Myanmar, Bangladesh, Nepal and India before it reaches its final destination in Mumbai. The route includes areas of arid desert and scrubland, steamy jungle and high mountain Himalayan passes in conditions ranging from hot and humid, intense cold, snow and monsoon rains.